Nearly everyone one on the planet watched this show and had a favourite character. Either one of the main characters, or one of the smaller ones - and they all made an appearance in the final episode. I loved Elaine and the George really grew on me - probably why I like Curb your Enthusiasm so much. I thought Kramer was fantastic. And I'll add that Jerry's parents and George's parents were annoying. I found Seinfeld annoying but I did find Kramer somewhat amusing. 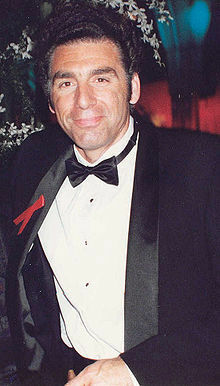 Kramer was a favourite for me too. I found Seinfeld about as funny as watching paint dry. I don't know what people see in it. Brilliance like never before that's what we saw in it. Kramer was my favourite as well. Jerry, on the other hand, was not funny at all. He really got under my skin. They are all my favourite. I think like Jerry, I get angry and scream like Elaine, I invent things like Kramer and I am a loser like George. That is why these characters and the show is the best in the world ever. As for one of the semi regular characters it has got to be Puddy! Kramer always drove me nuts. Although not one of the main characters, one of the most memorable was the Soup Nazi. ( no soup for you - come back one year!) haha. Hubby & I still use that line as a joke at home. Loved the soup nazi episode.... we were about to stop goig to our fave bakery - it was the same experience, but after watching this episode, we kept buying from there, just with a little secret smile to ourselves. A professor in the USA has his physcology students at uni. doiing a project onthe minds of the jerry,george,elaine and kramer (who annoyed me). That would be interesting!!! Do you revisit old Series you used to love? Do you love the Mindy Project?